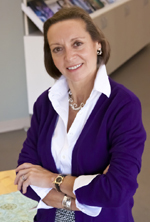 Maria McIntyre joined Maine International Trade Center in November 2014 as Managing Director of Invest in Maine. In this role, Maria works with local and overseas partners to introduce foreign companies to Maine as a potential site to locate operations, or to invest in any number of crossover industries. Promotional efforts target European and Asian markets focusing on the state’s established industry and R&D capacity in advanced materials/composites, forest products, food and beverage, and life sciences. Maria has worked in communications promoting economic development for more than 20 years. Most recently, she served as Associate State Director of Communications at the Maine Small Business Development Centers, a national program of the U.S. Small Business Administration. Prior to moving to Maine, she lived in Washington, DC, where she served as Vice President for Public Affairs and Director of Job Development and Outreach during her 15-year tenure at the Home Builders Institute. Maria also spent a number of years in public affairs and management consulting for private, government, and overseas clients, including investment and trade promotion in Southern Africa and the Caribbean. Born in Santiago, Chile, and reared in Madrid, Spain, Maria holds a B.A. in International Relations from American University, and an M.A. in Latin American Studies from Georgetown University.